CA Advocacy Alert- "Support Both Ends of the Leash!" A new California Bill Senate Bill 258 “Support Both Ends of The Leash” would provide funding for California homeless shelters to provide food, shelter, and veterinary services to homeless people and their pets. This proposed legislation will provide CA homeless shelters with the resources needed to offer veterinary services, food, and shelter to the homeless population and their pets. Report indicates drops in veteran and family homelessness but shows an increase in homelessness and significant racial disparity. This month My Dog is My Home had the opportunity to attend and participate in the Fifth International Veterinary Social Work Summit at the University of Knoxville Tennessee. The conference had the theme of “Animals and Poverty” and brought veterinarians, social workers, and advocates from across the world for a three days gathering to address issues of homelessness and non-human animals in poverty as well as access to care and barriers to support. New York City has the highest population of individuals experiencing homeless and yet no homeless shelters in NY allow animal companions. 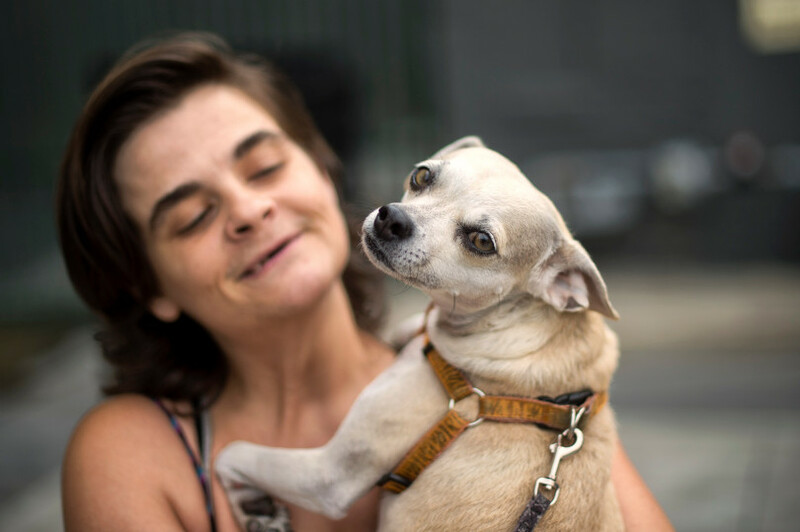 Animal Care Centers, which operates NYC’s animal shelters, offers one of the only stop gap measures to keep human-animal families intact in circumstances of homelessness. They offer pet retention programs that foster or board companion animals until they can be reunified with their family. We are pleased to announce that the pilot year of our Co-Sheltering Collaborative was launched on July 30, 2018. To promote an understanding that accommodating human-animal families in homeless services is both necessary and possible, the Co-Sheltering Collaborative - a national community of homeless service providers and government organizations who are actively working on the implementation of co-sheltering - has been developed to share expertise and showcase examples of innovative programs that address integrated human and animal sheltering needs. A recent effort by Los Angeles Mayor Eric Garcetti is making it easier than ever to open emergency shelters in communities across the city to provides beds and much needed services to the unsheltered. Garcetti's plan called A Bridge Home enables city council members to identify a site or building adjacent to a high-density homeless population and create an emergency shelter on any land owned or leased by the city. Congratulations to the Weingart Center on the opening of their brand new on site dog park last Friday! Weingart Center shelters upwards of 600 people daily in their Skid Row facility in downtown Los Angeles. If Weingart Center can accommodate animals, we are confident that other programs can too. My Dog is My Home thanks Weingart for being a partner in this work to co-shelter people and animals together, and for being a stellar example of how it can be done successfully. It is our pleasure to be a witness to their transformation to truly embrace the #YesDogsAllowed philosophy. Read the coverage of Weingart's dog park opening in the LA Times and the Daily News. To promote co-sheltering on a wider scale, we need to make sure the few programs that do accommodate animals on site are positive environments for both clients and their staff. We can't ignore the fact that there is a public health risk when domestic animals and people share congregate spaces. To mitigate the chance of bites, dog fights, and other liabilities, we are encouraging the providers we work with in the Los Angeles area to invest in behavior training for shelter residents with dogs. This is the sound of the South LA animal shelter. It can be heard from blocks away, even over the din of rush hour traffic. This sound demonstrates one reason why we promote pet retention within the homeless community. As animal lovers, we are often asked how we can do this work when people experiencing homelessness can't even take care of themselves, and therefore, they don't have the right to keep an animal. CBS New York interviewed Shaunyece in November 2015. In the interview, she talked about how the no-pets-allowed rule kept her out of the shelter system. Unfortunately, Shaunyece and her three cats still live outside today. Thanks to a field connection from Human.NYC, we were introduced to Shaunyece and her three cats. We are aiming to capture her experience of being a cat guardian on the streets - both the joys and challenges - and promote her story as an example of why animal accommodations in homeless services is critical. We are looking for reliable volunteers who can assist with filming. The time commitment is two full days of filming over the course of two months. If you'd like to contribute your time and talents, please contact Christine at christine@mydogismyhome.org. After a year of opening up their federal strategic plan to feedback from the general public, the United States Interagency Council on Homelessness (USICH) has released their new plan to prevent and end homelessness. Home, Together starts out beautifully by calling our attention to the meaning of the word "home" - an idea we hold close to our hearts at My Dog is My Home. LA Family Housing's newly renovated dog park. The National Alliance to End Homelessness is hosting a webinar that will highlight emerging practices for shelters that are accessible to people and their animals. This webinar is the ninth in the Emergency Shelter Webinar Learning Series and will expand on one of the key elements to effective emergency shelter, low-barrier access, by delving into the operations and practices of shelters that are accessible to people and their animals. Join Alliance staff and a shelter provider to learn how to shift philosophy and operations to welcome animal owners and a more vulnerable population into shelters. Our good friends at LA Family Housing will present on practical considerations and creative solutions for shelters to consider when making this shift. This webinar is free. Click here to register. Call to Action for NYC Residents: Put Co-Sheltering on Mayor de Blasio's Radar! There are currently no homeless shelters that allow pets in New York City - the homelessness capital of the US. THIS FRIDAY, we ask that you join us in asking mayor Bill de Blasio how he plans to address homelessness and animal companionship during his NPR segment #AskTheMayor on the Brian Lehrer show, 10AM - 10:30AM ET. Below, we have provided sample tweets, graphics to repost, and questions you can read if you choose to call into the show. Use the hashtag #AskTheMayor to ensure your tweet is viewed, or call the hotline at 212-433-9692. We are currently conducting an evaluation of a large permanent supportive housing provider's emotional support animal protocol. According to the Fair Housing Act, all HUD funded shelter and housing programs are required to make a "reasonable accommodation" in order to allow a person with a disability the full use and enjoyment of a dwelling. This means that even in the face of a no-pets-allowed rule, shelters must accommodate emotional support and service animals as long as the request is "reasonable". From March to April, My Dog is My Home worked with five shelters ranging in size and location throughout Los Angeles County and trained in various topics to help ensure safe and accessible spaces for both people and animals. We are looking forward to returning for follow-up training in June. In the face of the "no pets allowed" rule, some people experiencing homelessness are utilizing the Fair Housing Act's protection of emotional support animals to keep their animals with them while obtaining shelter or housing. People with disabilities are within their rights to have a service or assistance animal at HUD funded shelters. Yet, many homeless service programs have not yet implemented service and assistance animal policies to be in compliance with the law. As part of an ongoing effort to build understanding of how homeless service agencies can implement effective animal-friendly policies and protocols, My Dog is My Home will be evaluating the emotional support animal protocol of a large permanent supportive housing provider in Los Angeles. The evaluation will entail interviews and focus groups with both staff and clients, as well as a review of property management records. In partnership with the Los Angeles Homeless Services Authority, My Dog is My Home will be providing customized training to five emergency shelter and bridge housing providers who recently expanded to accommodate animals on-site. While the shelter and bridge housing workers have dedicated their careers to working with people, animals are new territory for many of these shelter staff. The customized trainings will cover a range of topics identified through conversations between My Dog is My Home, Bark Avenue Foundation, and the shelter and bridge housing programs' management. Trainings will be held March 26-30. We thank Bark Avenue Foundation for their generous support of our work in Los Angeles. My Dog is My Home is in discussion with the the Office of Council Member Stephen Levin about drafting legislation to keep individuals and families experiencing homelessness united with their animals. In addition to increasing the well-being of families entering shelter, this bill will help reduce avoidable surrenders to municipal animal shelters. We are excited to announce our new data collection partnerships with the Veteran's Multi-Service Center and the University City District. These partnerships will help us continue to assess the needs of people experiencing homelessness in Philadelphia and meet our goal of expanding co-sheltering options in the community. Do you work with a homeless service agency that can add 1-2 questions to their existing intake or engagement forms? 1-2 questions is all it takes to help! Email Christine Kim (christine@mydogismyhome.org) if your organization is interested in becoming a data collection partner.